As the Python abruptly regurgitated our stiff bodies into the iridescent blue pool, our expressions of wide-eyed jaw-gaping astonishment melted into infectious giggles. Quite possibly we had just enjoyed one of the best waterslides in the entire world, and we’d done it as a family. I am not sure how many times we have been to Waterbom, but it never gets old. The first time would have been over a decade ago, back in 1999, and most recently in January 2015. Before this year we had visited back in 2012 when we kick-started this blog and our epic nomadic journey (you can read about here). 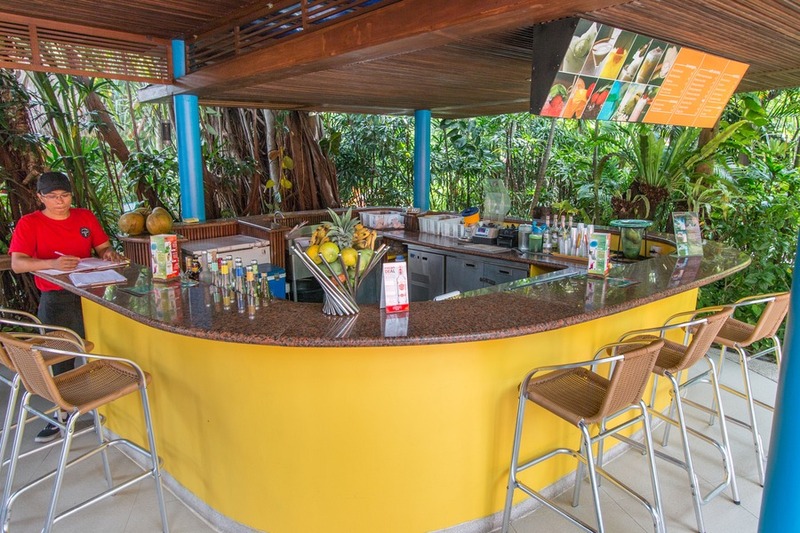 But we were pleasantly surprised with the substantial changes in the park over the last three years, transforming from one of our favourite waterparks, to one of the best in the world (according to TripAdvisor). As I write this, 3 slides have been torn down to make room for 4 newer, faster and taller slides which will open in the first half of 2015. Say goodbye to Smash Down, Race Track and the Boogie Ride. It’s okay, I didn’t like those ones anyway, even if Josh did. Haha! 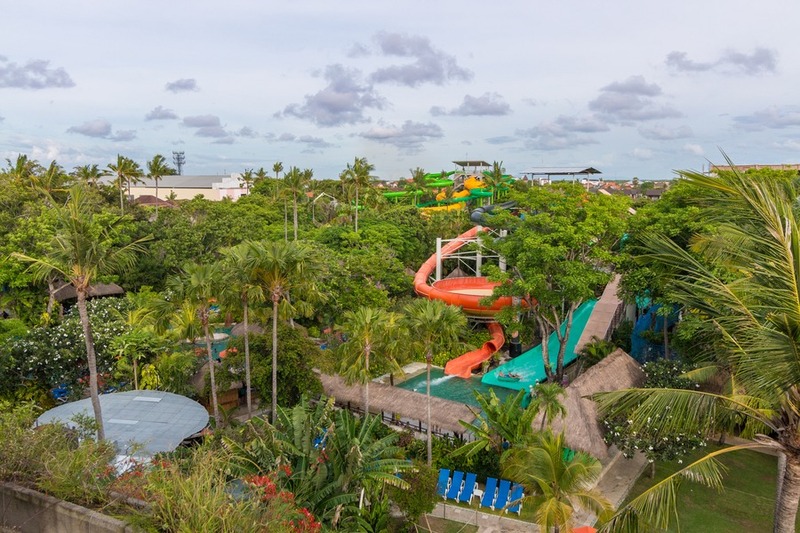 Later this year Waterbom plans to open the first Flow Rider (stationary wave pool) in Bali. Yay! Those are so much fun. 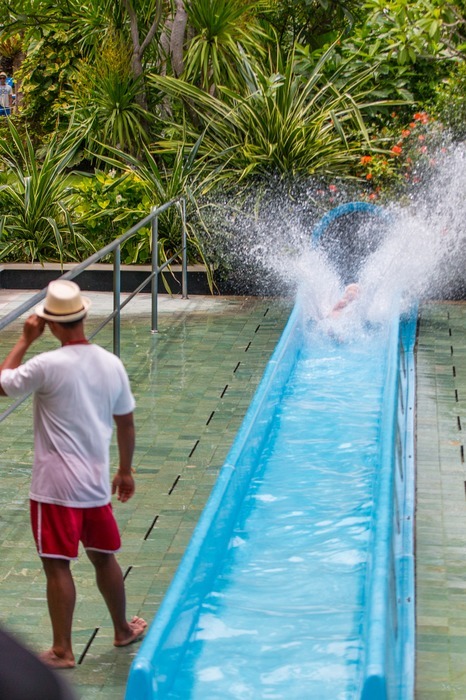 While we were in Bali we took the chance to try the new slides that have been launched since our last visit. 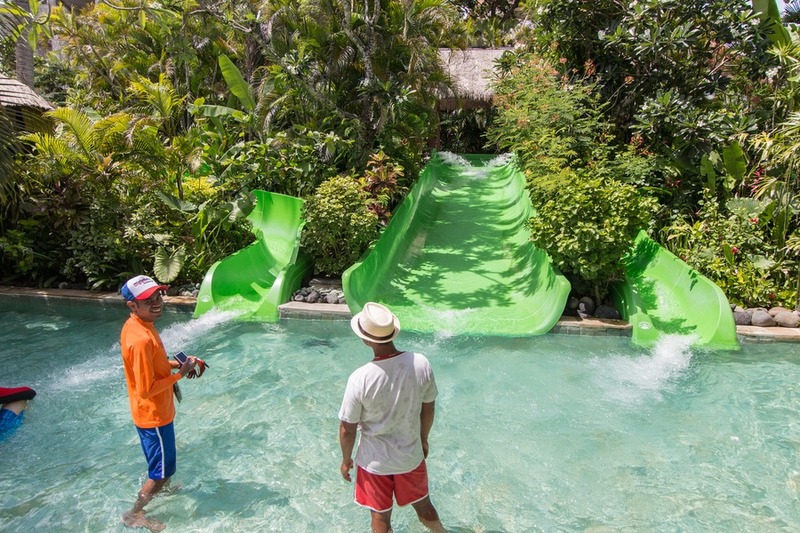 The Python – This was a family favourite and is one of the widest waterslides in the world (with segments up to 6 metres in diameter). 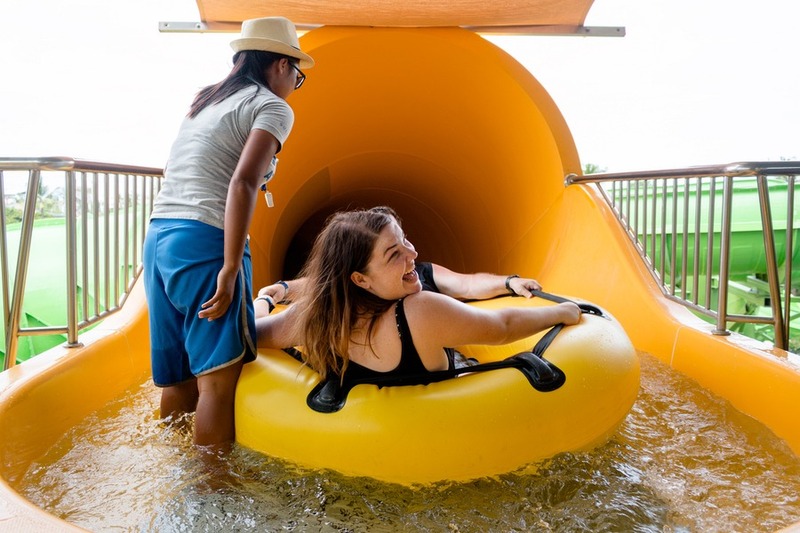 3 to 4 people ride in a circular tube through a twisting, funky yellow-and-pink slide to splash down in a shallow pool. Lots of screams of delight on this one. 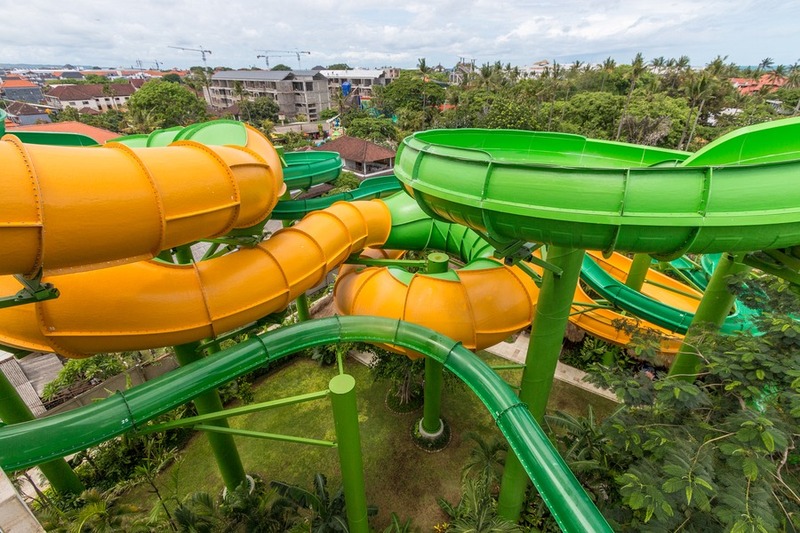 Green Vipers – One of Waterbom’s newer rides, this slide utilises the latest generation fiberglass materials. The Green Vipers start at a lofty 19.62 metres in the air with an ultra fast and silky smooth ride. Constrictor – This is the longest “snake” slide in the world at ¼ kilometre in length. It sure felt that way going down it. Pipeline – Similar to the Green Viper, but with a touch of inspiration from The Climax, Pipeline whisks riders along for a tightly twisted, fast, smooth ride in a fiberglass pipe. It starts 20 metres above the ground and takes approxiamtely 10 to 13 seconds to fly through the 150-meter tube. 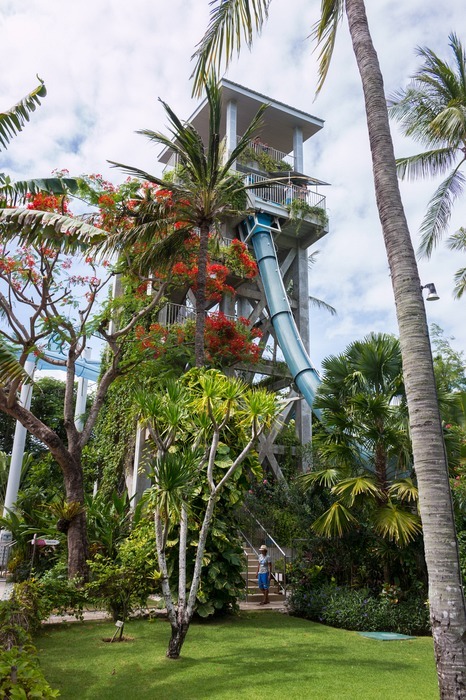 While we were waiting on this tower, we enjoyed the phenomenal panoramic views of the Kuta skyline and Waterbom’s lush gardens. 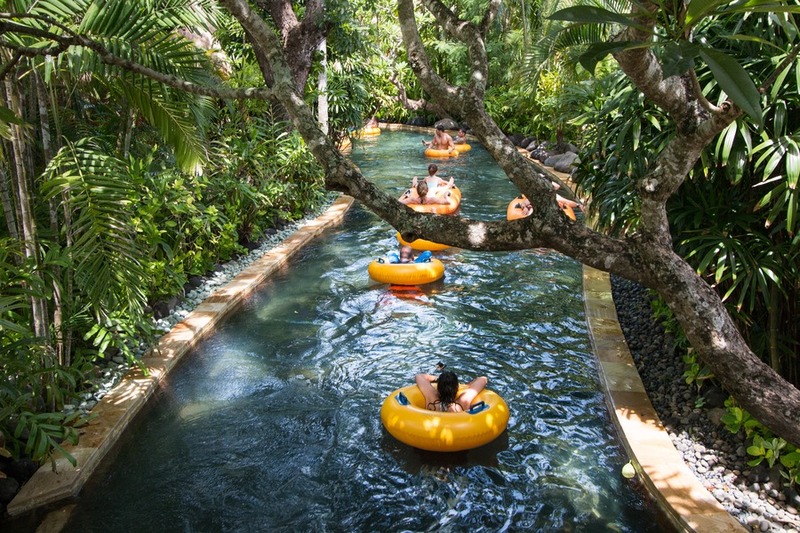 We returned to our previous favourites - the Boomerang and the Lazy River. But I still can’t stand The Climax it’s terrifying! Josh, on the other hand, didn’t blink twice and braved the vertical drop slide multiple times. 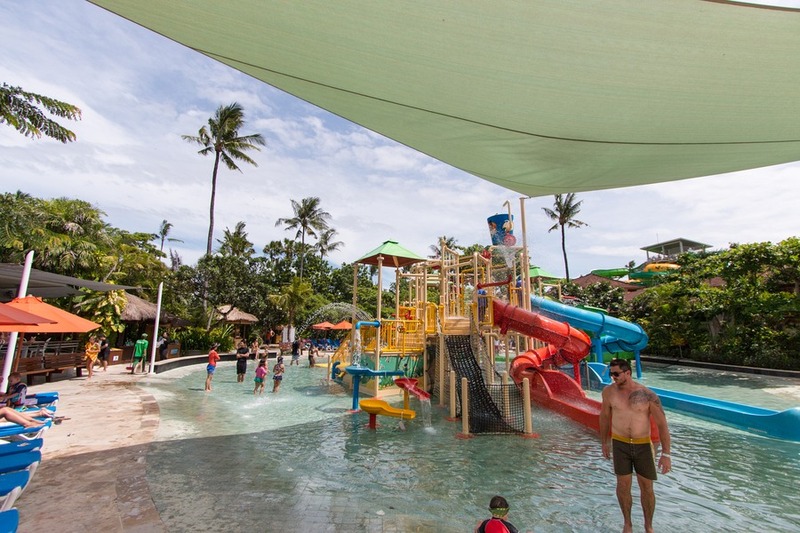 Waterbom is so much more than just slides. 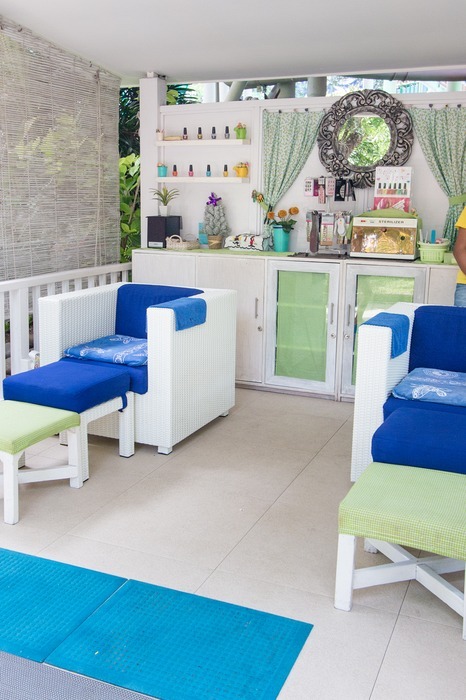 It’s best described as a refreshing oasis in the middle of the hectic, muggy Kuta. 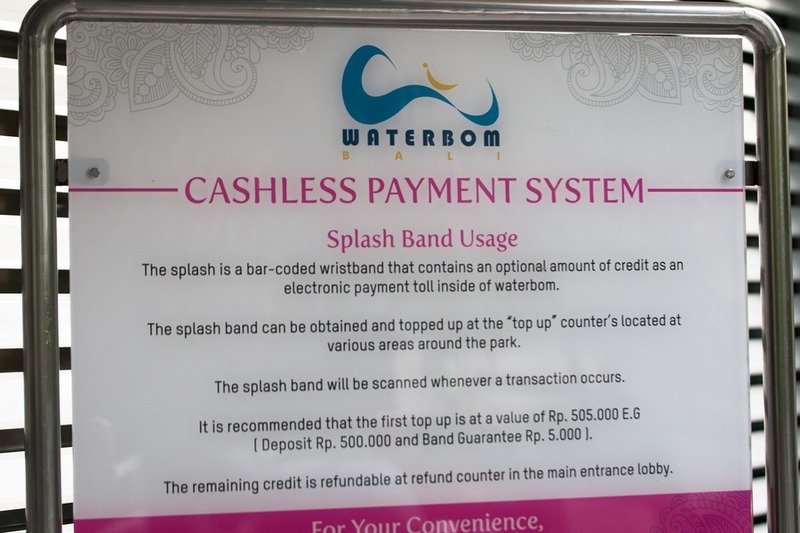 68% of Waterbom is garden. 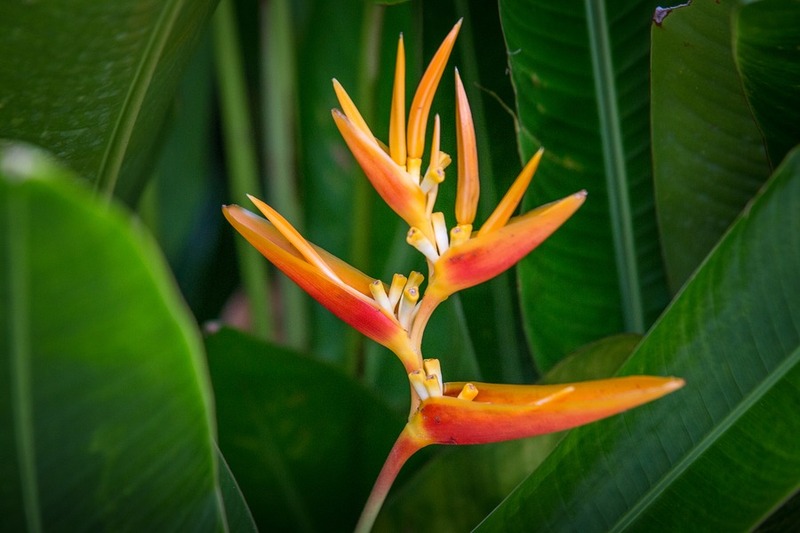 3.8 hectares of landscaped gorgeous, tropical gardens with dainty flowers, grassed areas and plenty of shade to relax under. We couldn’t help but spend the whole day there. On top of that they have been developing the food court nicely. 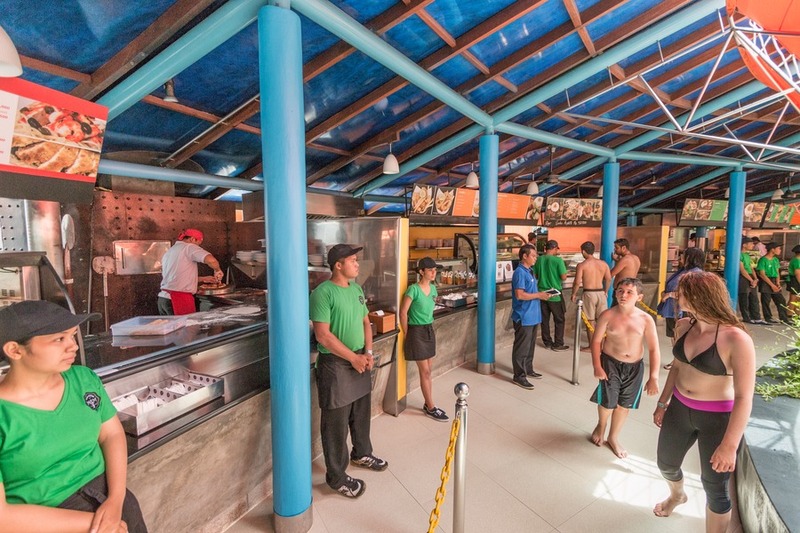 The selection of international cuisines should please any visitor, from Mexican to Japanese to Indonesian. My kids’ favourite snack was corn on the cob (Bali pricey at about $1.50) while mine was the brand new, and simply divine, fried bananas. Josh couldn’t go past the traditional Indonesian noodle dishes. 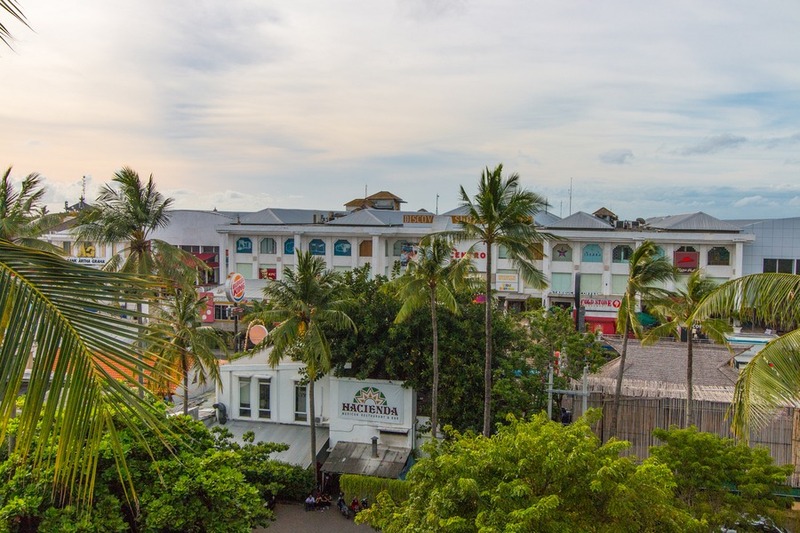 If that’s not your style you can use the swim up bar or request a re-entry stamp to leave the lush gardens and venture into the busy Kuta streets lined with thousands of dining options. 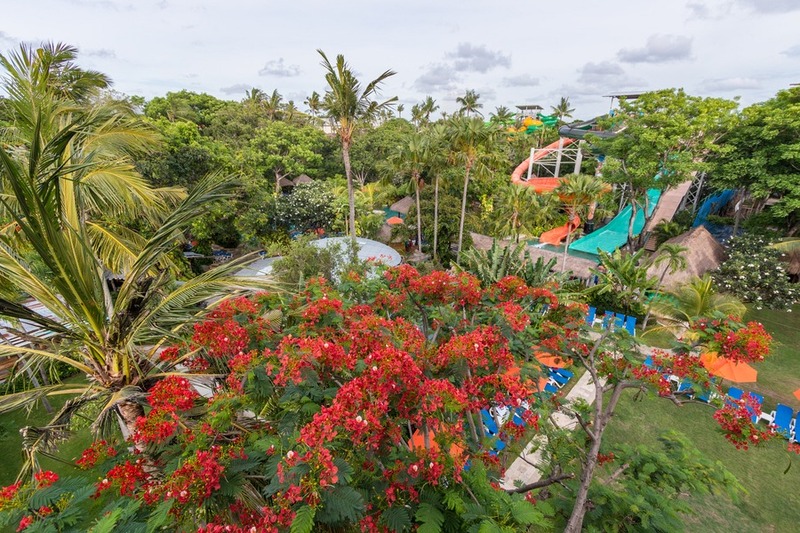 Environmentally minded visitors will be pleased to know that Waterbom recycles 3600m3 of water each day. 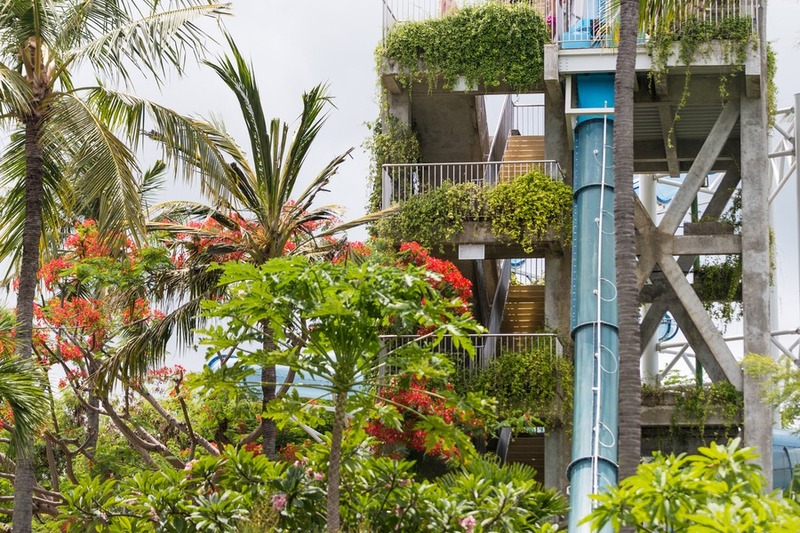 The waterslides are all built and maintained to strict international safety standards, so we didn’t feel concerned for our wellbeing unlike several other places we’ve visited in Bali. Waterbom also claims to use an advanced salt chlorination water sanitizing process that is gentle on the environment and on your skin. Having sensitive skin, I can attest to that. 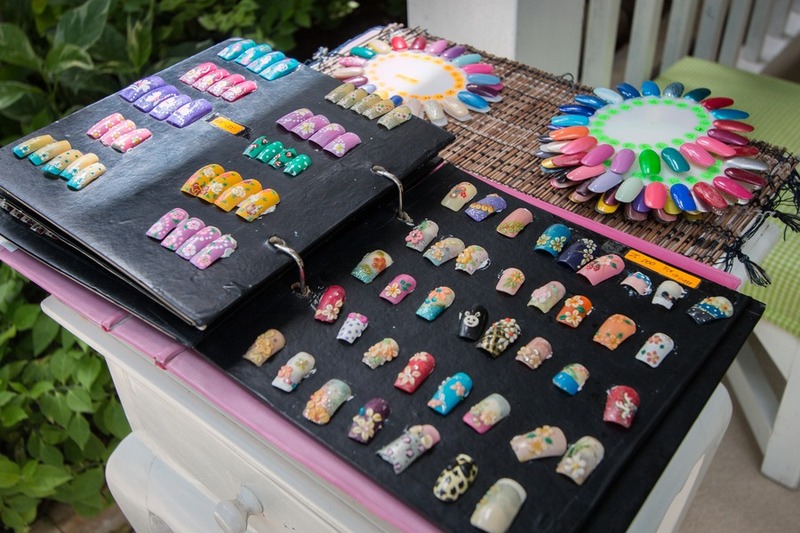 Go Cashless - There is a convenient cashless payment system within the park for purchasing food, drinks, photos and additional services (such as nail painting, massage or on-the-spot portraits). 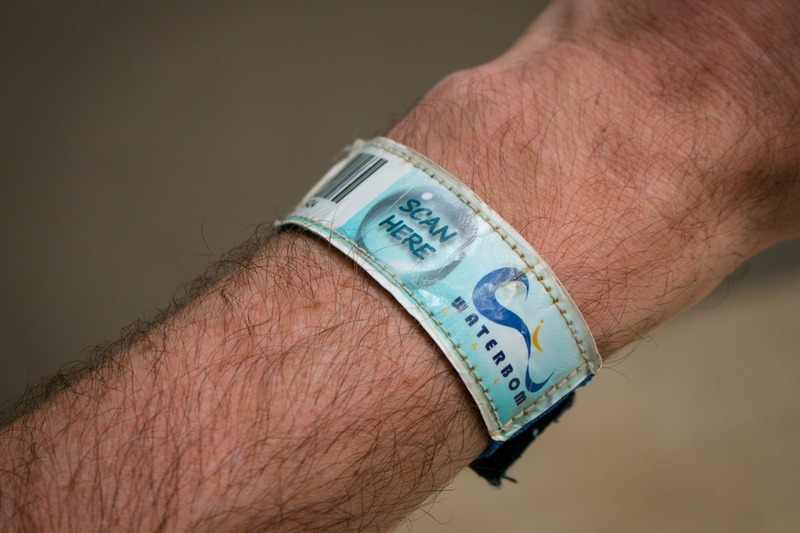 You will receive a Splash Band at the entrance, which stores credit information and can be scanned throughout the day. 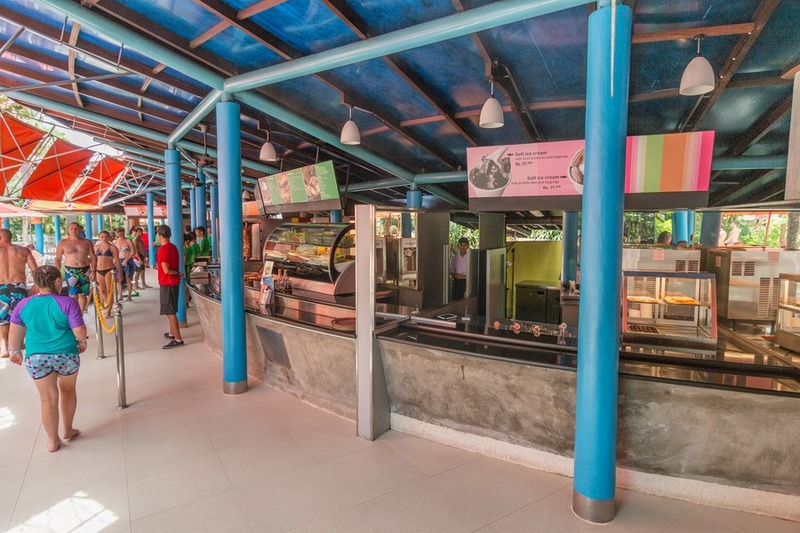 Stations for recharging your band or checking the balance are dotted around the park. I’d recommend depositing about US$50 on it, and don’t worry because unspent funds are refunded at the end of the day as you exit the park. Jewellery – For extra piece of mind leave your jewellery at home. That way you won’t worry about it coming off on a thrilling slide. 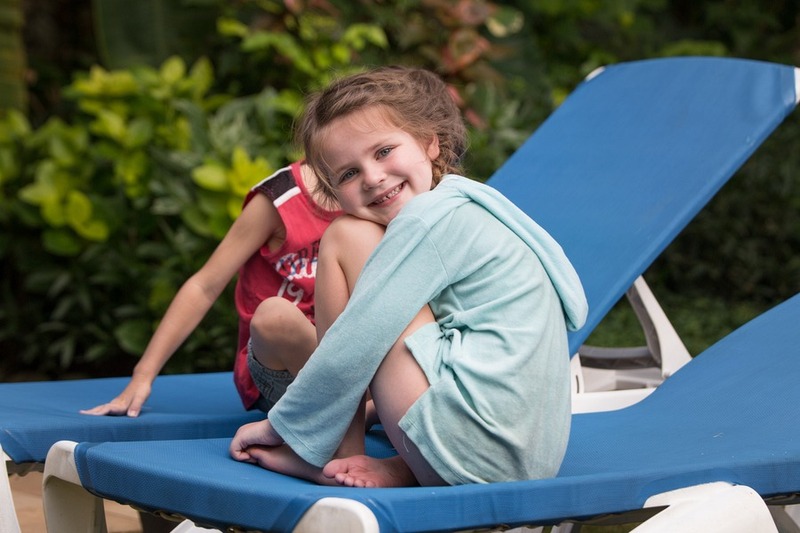 Towels – While towels are available to hire for a small fee, you probably don’t need them. 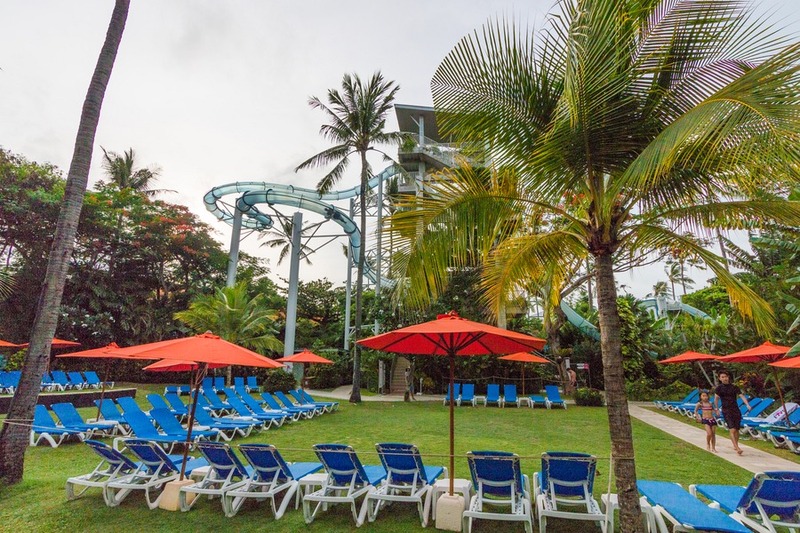 In the tropical Bali sunshine we usually dried up before we made it back to our deckchair from the slides. 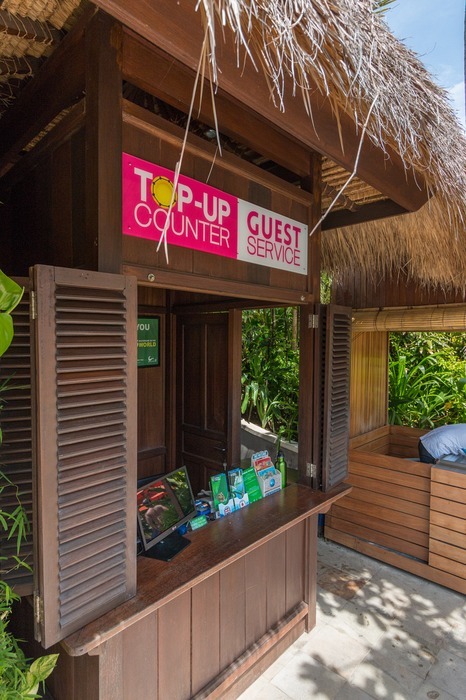 Come Early – If you are with a group you can hire cute little huts. But they sell out early. We arrived about an hour after opening and there were none left. Leave Late – For some strange reason most visitors tend to disappear after 3pm. So save the busiest slides until later in the afternoon. The lines are minimal and you can ride again and again… if you can still climb the stairs by then. Got Kids? 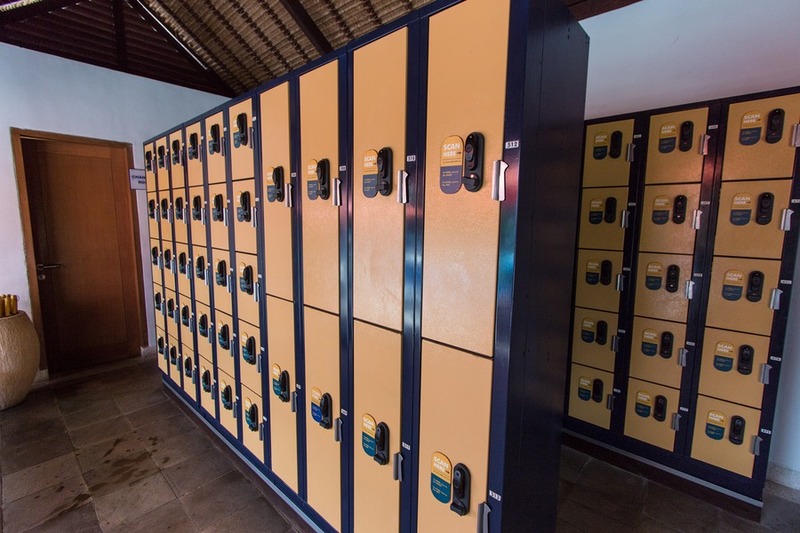 - Most visitors head to the lockers near the entrance. 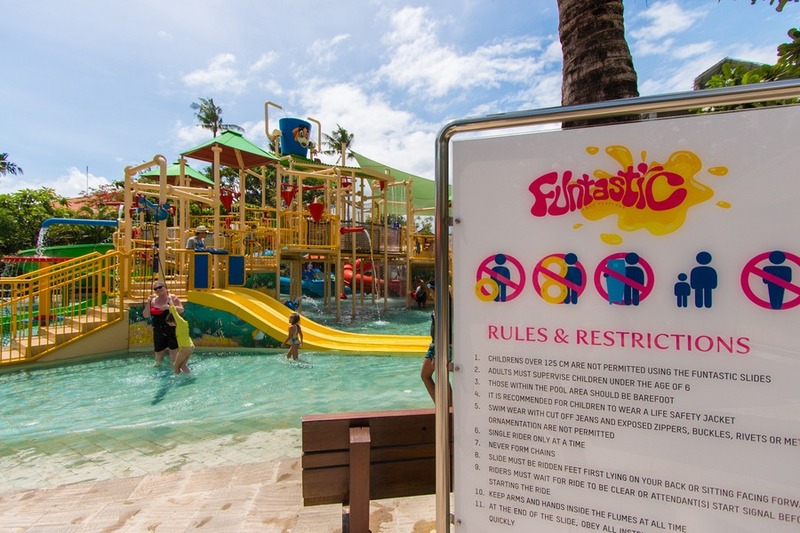 If you’re bringing children there are more lockers by the Funtastic kids water playground. Use those and save a chair so when you are exhausted by the fun, the kids can still go water crazy while you keep an eye on them. 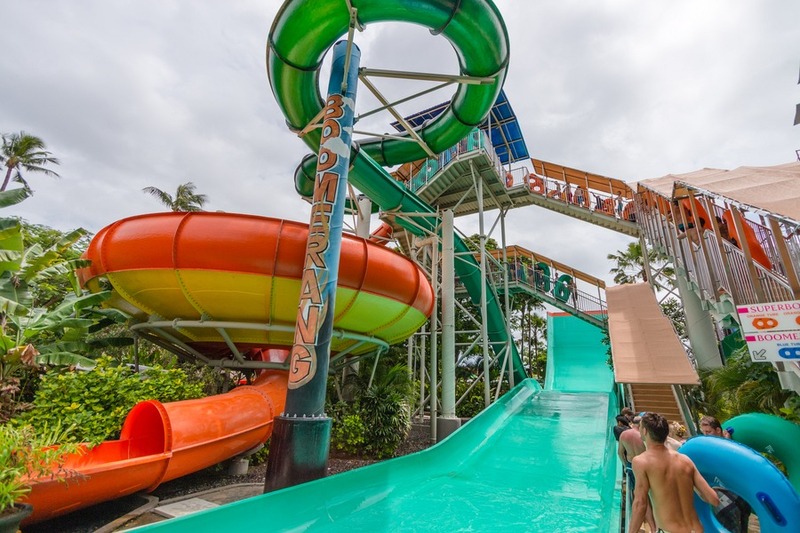 If you have never been to Waterbom then add it to your bucket list. 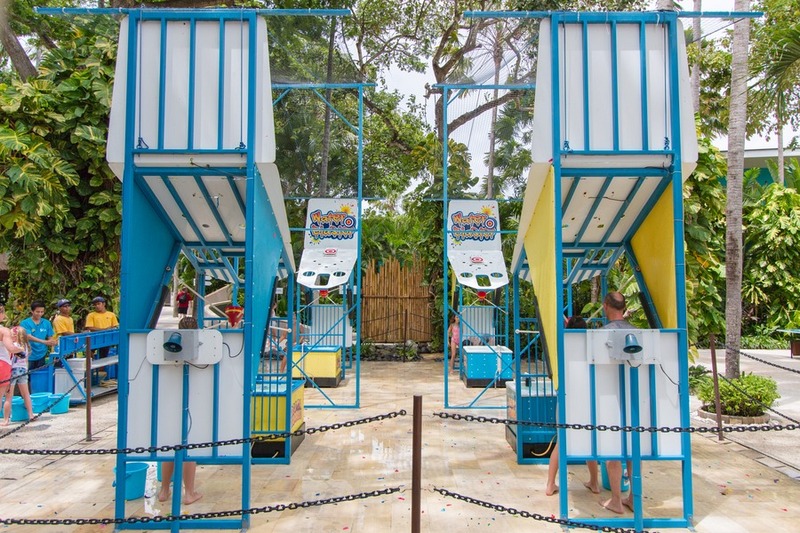 Or if you’re a frequent visitor to Bali like us, then chances are you may not have tried some of the new rides. 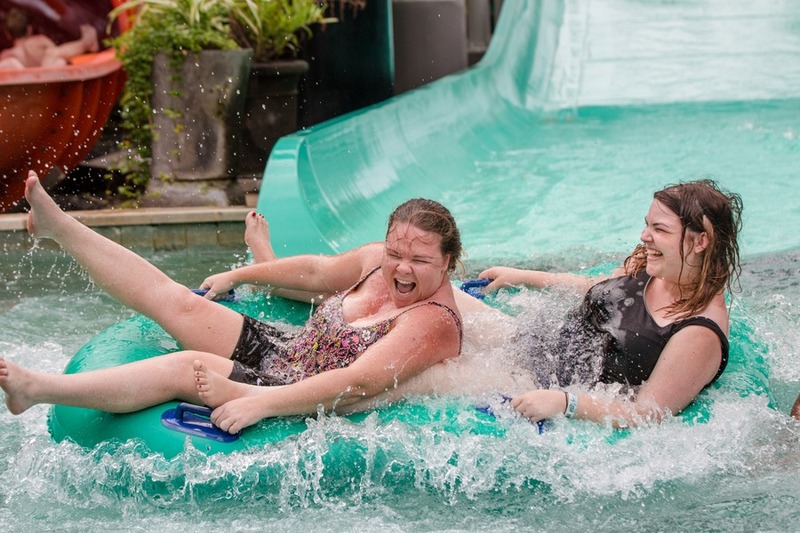 After all the waterparks we’ve visited around the world we still immensely love Waterbom. 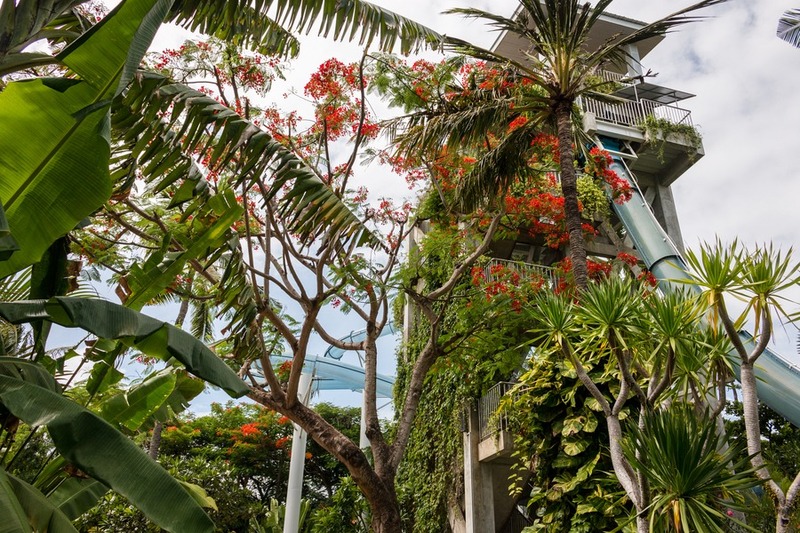 The lush gardens immediately transport me into a calming, relaxing environment, which is just what my heart needs before taking on a few of those thrilling, white-knuckle rides. 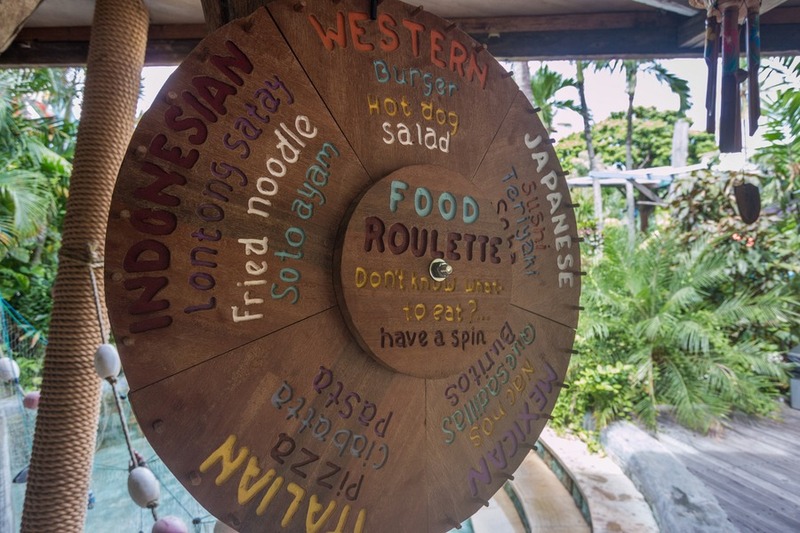 After 10 visits we have plenty of suggestions anywhere around Bali. Read it here. 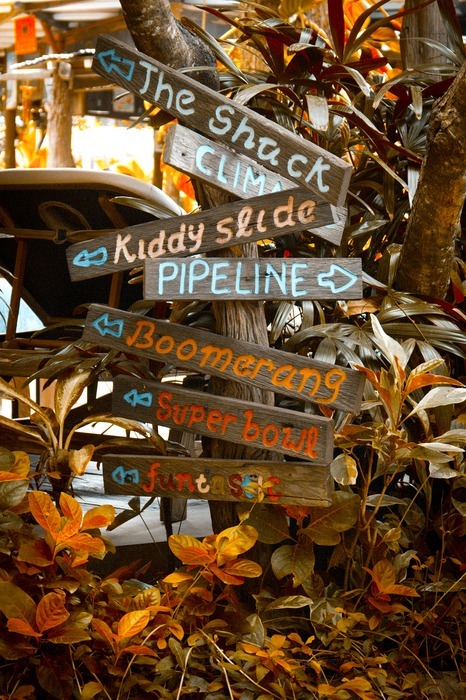 Or start searching right by Waterbom now! 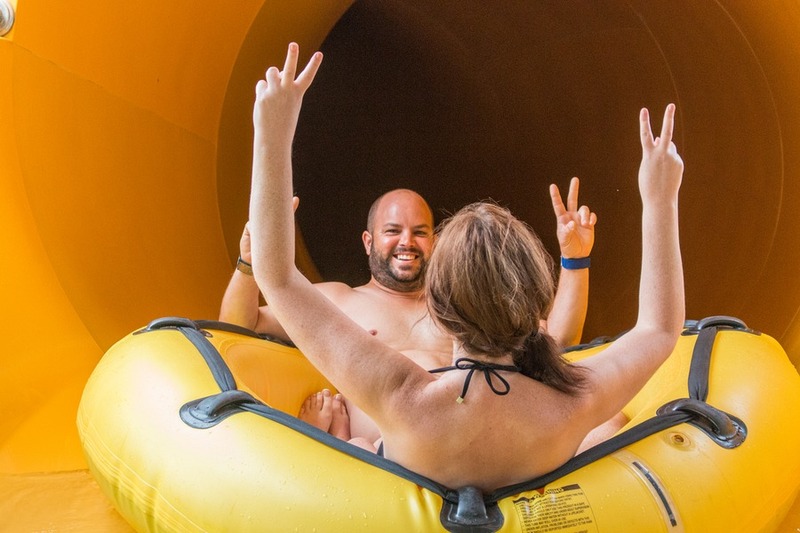 You're right about Waterbom being great! We've been once already, and LOVED it! We'll be going back again for sure when we're in Bali this spring, and I can't wait! Sounds really fun for a family vacation. I like the sign that says "you just burned 22.5 calories - it's a good day". 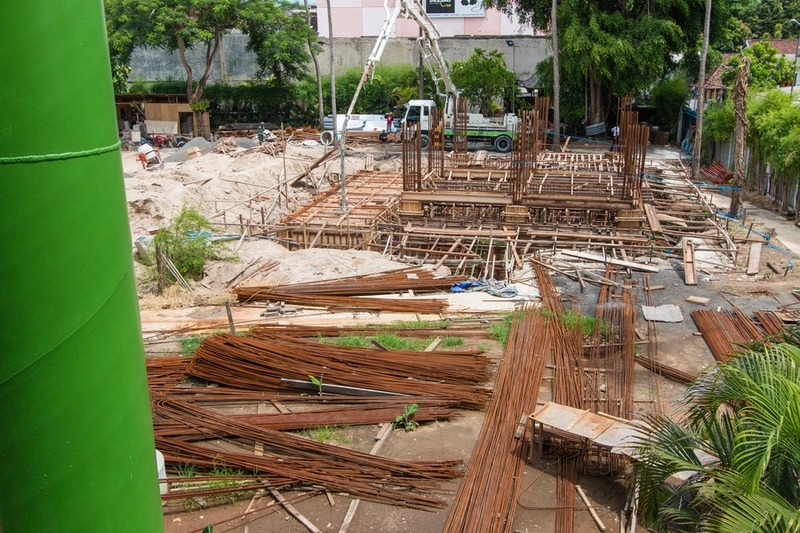 Hi, we just came back from Bali, but sadly we missed this fun park. Hopefully next time. But is it for tots as well? You know me, I'm the less adventurous traveler. But it doesn't mean I have to overlook this amazing water park! It looks really fun with commendable management system. I can see that everybody had fun, most especially the kids! And as always, I love your photos! "i love the way you've written that post, gorgeous photos, great info and it was fun to read!! -makes me want to go again to try those new rides! Coolkidszcooltrips- Yes definitely. The Funtastic play area is great. You can see more of that in the previous post - http://travelwithbender.com/travel-blog/bali/waterbomtastic/ That post was written when my kids were 2 & 3. They have a few smaller slides right near by as well. Which my 4 year old could do by himself, the water is shallow and there are loads of lifeguards for that extra security. This looks awesome!!! Will definitely add this to my travelling bucket list! Water Parks are awesome places for holidays and party planning.In all over India, there are many wonderful water parks having lots of fun. I would like to go there and enjoy with my family and friends. Hi there loved the blog. Would love to hear your thoughts on buying the two day pass as opposed to just one day for my 9 and 7 year old girls. Also is it a must to pay the extra $$$ to go express? So nice pictures!! They are tempting me to make a plan for this superb water park. Bali is my dreamland and when I will visit it, I will have a lot of fun exploring every nook & corner of it. At present, I am having a great fun at an indoor Waterpark in Montana for relaxing in hot water tubs.